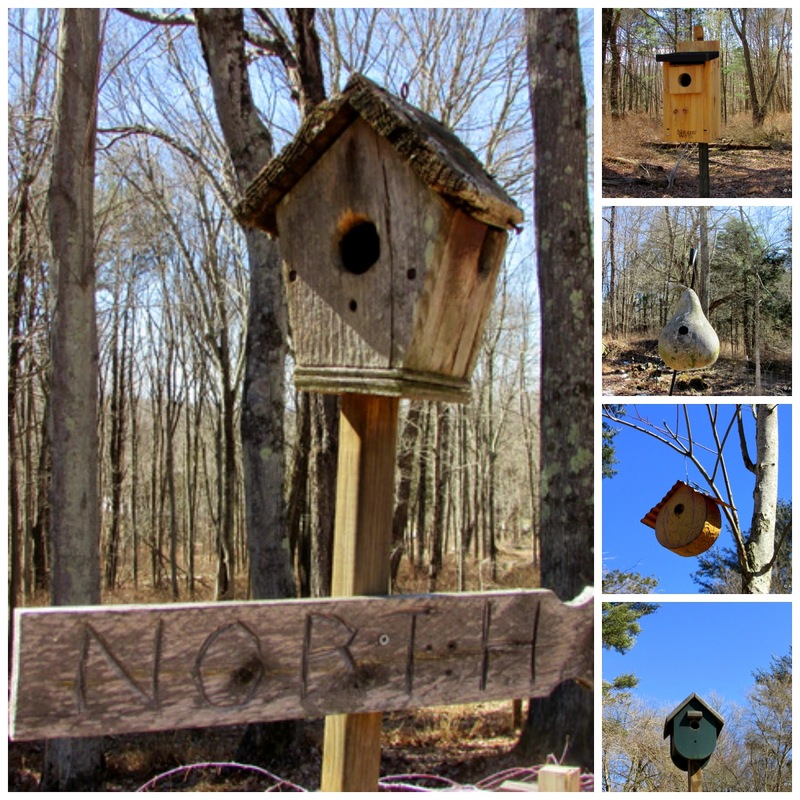 The birds out our way have quite an array of housing to choose from. As you can see, we don't go for all the fancy decorated and painted houses. In fact, the birdhouse in the above photo with the "North" sign under it, was modified by a few of our fine feathered friends a few years ago. Apparently they wanted a picture window. Now although we have no fancy houses, what we do provide in addition to the small creek, are trees, shrubs and berry producing bushes that give them a little extra nutrition. Blueberries, raspberries, Pyracantha, along with a variety of shrubs and perennials to attract the bees and Hummingbirds are scattered throughout the yard for their enjoyment. giving them a plain and simple welcome. I love the bluebird. Simple and natural is good to me! It will be neat to see the baby blues.. Have a happy day and week ahead! Imagine my surprise to see your birdhouses. Our eye for photos must have been roving in the same direction this week. Have you seen the new thing in birdhouses? They are made of felt! Apparently the bird can pick off tiny pieces for his nest if he wants. There are many different kinds and shapes. TWENTY FIVE dollars!! None for us! You snapped the bluebird at just the right time! SO cute! i make some very rugged / rustic houses for my birds around here. i call them 'cabins' because birdy slum lord doesn't sound so good. What fine houses to choose from! They serve as the birds' nest too. Your bird community is wonderful. God bless you, JP, family, loved ones. Have the bluebirds arrived there already? I heard the tree swallows are returned to our area. 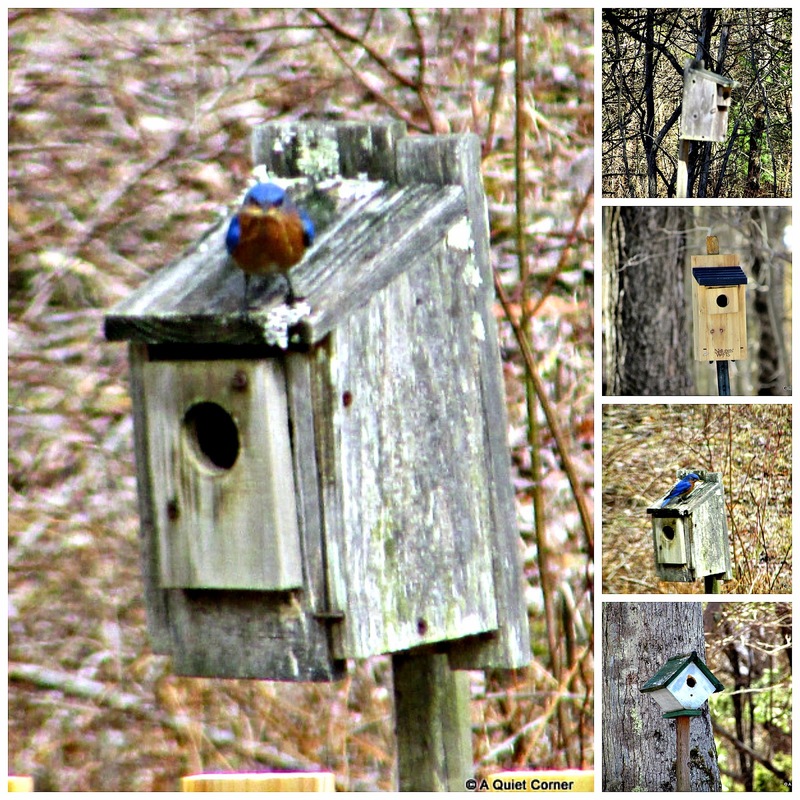 I guess we'd better get the bluebird house ready soon. You have a nice variety of birdhouses. Looks like a great place for birds! We have a tree in our front yard that has some huge dead limbs. We just leave it and the birds love it. We have bluebirds too. They are so pretty. I have painted a bunch of gourds and turned them into birdhouses. They are hanging all over the beeyard. I love the bright colors in the winter months. I wonder if country people in Australia also have bird houses? I doubt it as our weather is usually quite clement although in Victoria and Tasmania they do have snow in the high country during winter. An interesting thought and the range of bird houses you show are wonderful. so lovely to see the blue bird.. Your bird houses are really nice.. i would love to put some around. They are difficult to find here. Simple and natural is my preference as well and your birdhouses are lovely. Simple is good and I'm sure it works the same for birds that any house can be made a home. Sounds like an oasis to me!